Whenever I type "Birthday Blanket of Awesomeness", I can hear Jack Black as Kung Fu Panda saying it. The Birthday Blanket of Awesomeness was born from an idea. On April 16, 2012, I turned 40. I haven't turned super introspective for this 40th year of my life, but I did think, "Huh, what's my problem that I can never finish anything for myself?" 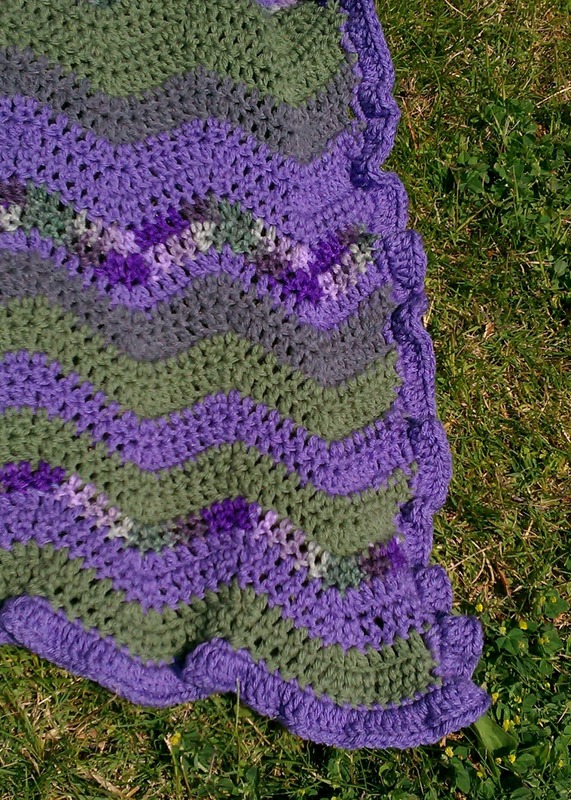 I've always wanted a ripple blanket and I decided that this was something I could do. I could take the time to make something for ME for a change. So back in February, I made a commitment: I would crochet myself a ripple blanket that would be all mine. At first, I imagined that it was a lovely rainbow ripple like the ones I've seen Lucy and Sucrette make on their blogs. But I decided that I have so much yarn in my stash that I needed to use it. When I went to look, I did not have a whole lot to work with. While plentiful, my stash does not contain a bunch of happy, spring colors and I definitely wanted happy and spring to be together in my blanket. At one the bottom of one of my containers, I found a lilac skein, followed by a green skein, followed by a lilac variegated yarn that just screamed "CROCHET US TOGETHER!" Using Lucy's Neat Ripple Pattern, I started my chain. Lucy's pattern calls for a multiple of 14 + 3 to start and rather than count from 1 to 140 or 196, I just counted 14s. I kept going until my chain looked long enough and started the first row. What I failed to realize was that I had 21 multiples of 14. Yes, 21. That's 294 chain stitches. When I finished the first row, I looked at the thing and thought: "What the heck have I gotten myself into?!" The row was ginormous. So, ginormous that I took it to my room and discovered that the blanket covered my California King sized bed and hung over by 2 feet on either side. The task seemed daunting. 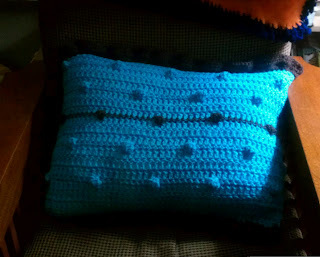 But, I had committed to crocheting a blanket for myself and I wasn't about to frog the thing. So, I crocheted my way through the first 6 skeins I had and realized that I was in trouble. Six skeins only made 23 rows. That was barely enough to cover my lap. I did some math and found that I would need at least 100 rows to cover my bed. 100 rows meant that I needed to buy a lot more yarn. A LOT more. Off I went to the store and after shopping for my new yarn, I did some more math. 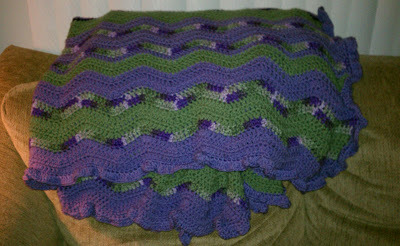 This darn blanket was going to cost me over $100 by the time I was done. With a sigh, I bought the rest of the yarn, adding in a dark purple and a gray for some interest. In the end, it took me a month to crochet. 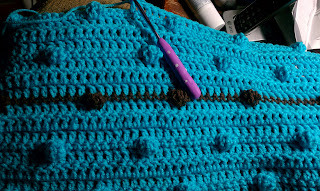 Nights were my primary time to crochet and I usually finished only a few rows. 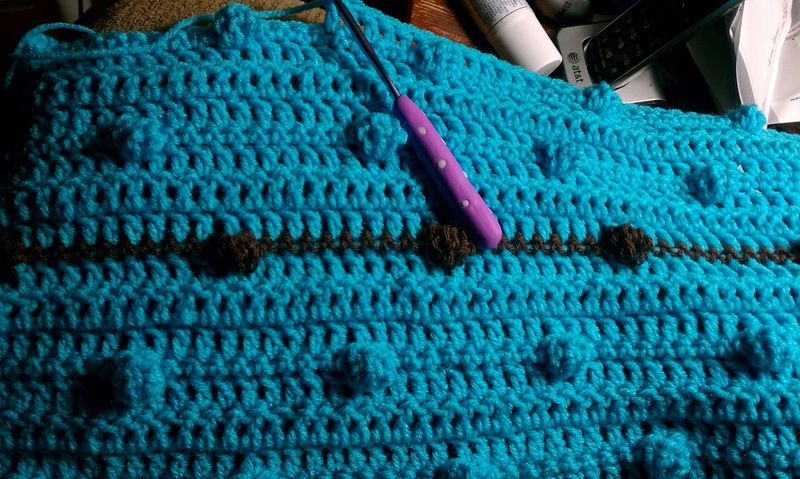 It took 35 minutes to crochet a single row. While the goal was to finish by my 40th birthday, it was not to be. However, I did finish it just this past Saturday when I added the row of single crochet border and a row of ruffle border. There is no rhyme or reason to the colors. I just used colors as I was moved to use them. 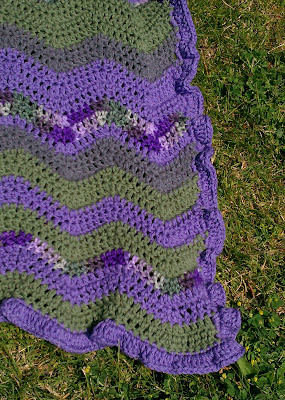 Those rows of dark purple were my milestone rows so that I did not have to keep counting. I just remembered that they were the 31st and 62nd rows. So much easier that way. The border is simple, but feminine. I like how the variegated yarn breaks up the solid colors. So how big is this thing? Well, when I hold it in my arms and stand up, it is well above my head to the ground. It is big and heavy. That's Gracie. She's 4 years old and 42 inches tall. I tried to get her brother, Lucas, to lay across my blanket diagonally, but he wasn't having any of it. The blanket is currently in my dryer and I intend for it to be on my bed tonight. I love my blanket and I am so proud of myself for finishing the darn thing.